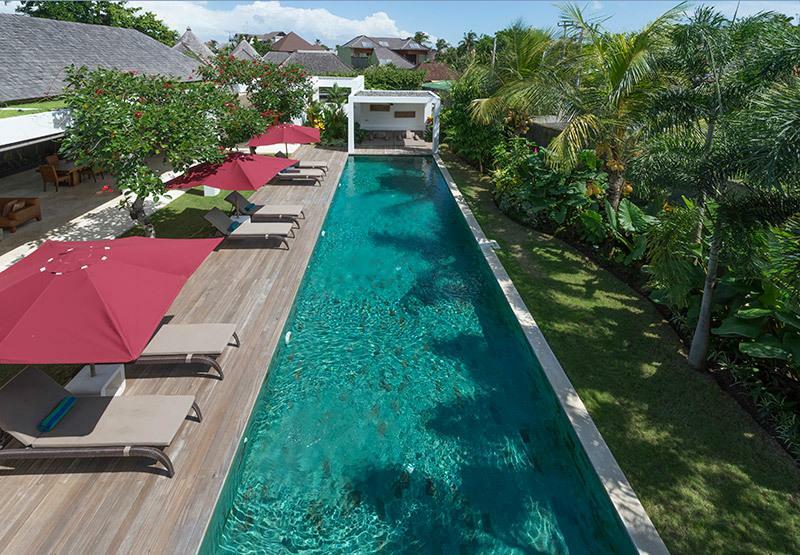 The villa rests within the exclusive and secure Laksmana enclave, just 500 metres from Petitenget Beach and within walking distance of Seminyak’s famous restaurants, shops, beachclubs, nightclubs, bars and spas. 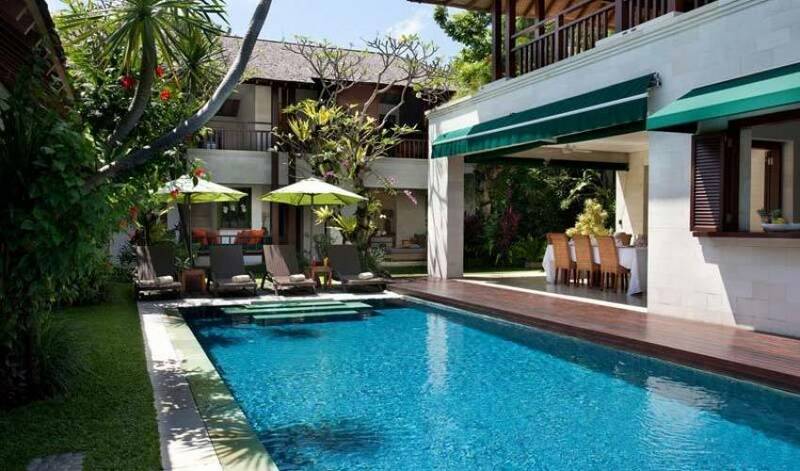 The villa is filled with sophisticated, comfortable furnishings, and comprises four bedrooms, all with audio-visual facilities, an 11-metre swimming pool, a well-equipped gym, an air-conditioned study, and semi-open-air living and dining areas, including an upstairs sunset lounge. This charming holiday home is ideally suited for families or groups of friends and comes with a full team of highly-professional staff, including a full time manager, personal butlers, and a superb in-house chef. 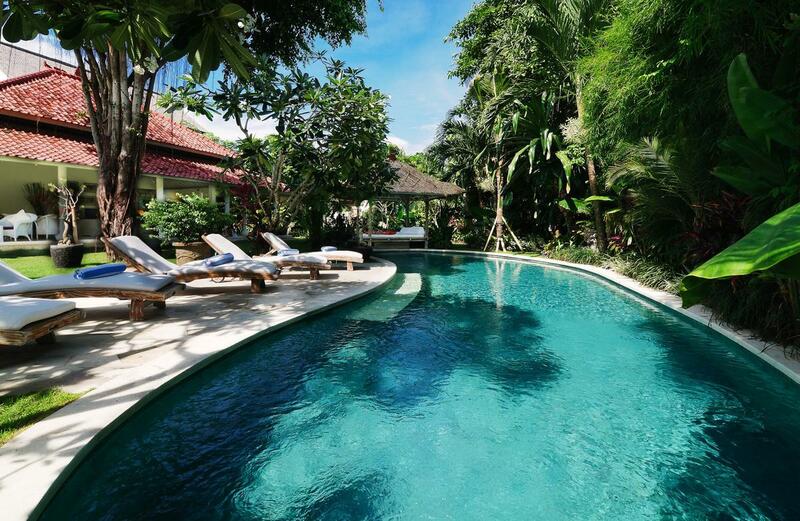 Welcome to Villa Shinta Dewi Seminyak, where tropical living is the theme. Breezy open-sided living and dining spaces and sunny decks are designed for relaxation and socialising; four comfortable and stylish air-conditioned bedrooms are situated around an 11-metre swimming pool, and a charming flower-filled garden completes the picture. 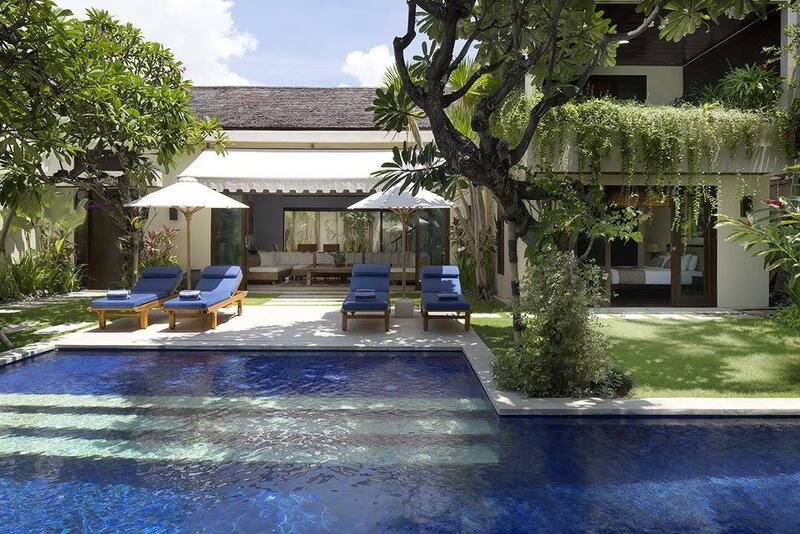 The villa comprises a single-storey building and two double-storey buildings surrounding a pretty garden and 11-metre swimming pool. On one side is the master bedroom, complete with an ensuite bathroom, as well as a communal study/TV room and a small but well-equipped gym. Opposite this is a semi-open-air dining room and gourmet kitchen with a rooftop sunset lounge above. Completing the circle is the two-storey bedroom pavilion housing two rooms on the upper floor, and one on the ground floor alongside an open-air sitting room and guest washroom. 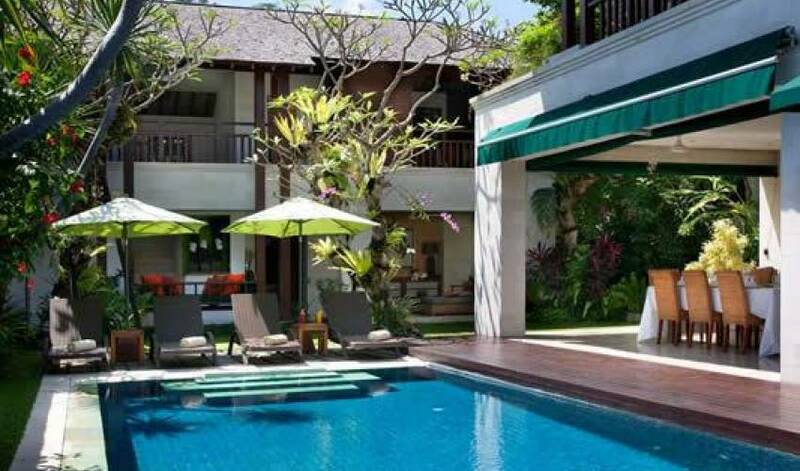 Villa Shinta Dewi Seminyak’s delightful, open-sided sunset lounge is sheltered by a soaring roof and furnished with comfy couches and easy chairs. From here, guests can relax under ceiling fans and enjoy some music as they admire the setting sun from this idyllic upper-floor lookout. Looking out over the pool and garden is the open-sided dining room, cooled by ceiling fans, equipped with a sound system and furnished with a grand wooden table that can seat up to 12 guests. The villa’s talented chef prepares delectable meals in the modern and well-equipped gourmet kitchen, which is immaculately outfitted in white. On the ground floor of the guest bedroom pavilion, and open on two sides to the garden and pool, a cosy sitting room provides a quiet spot for relaxing with a drink and a book. A washroom is located next to the sitting room, and a daybed provides a private corner a few metres away. A large discreetly located TV is also available for those who wish to catch up with the news or watch a movie or sport. Adjoining the master bedroom suite is the air-conditioned study and TV lounge, which doubles as an extra bedroom ideally suited for children. This room has a large flat-screen TV and is also equipped with a DVD player, two-seat sofa and a desk. Beyond the TV lounge is a compact, but well-equipped gym. 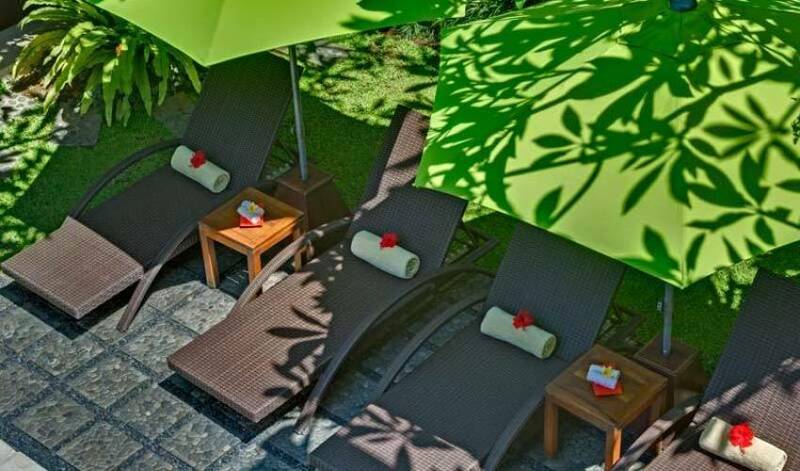 An ulin wood pool deck borders the 11-metre swimming pool, furnished, at one end with four sun loungers arranged below large green sunshades. Upstairs, on either side of the sunset lounge are two sun decks, one furnished with fun brown and orange beanbag loungers, that look down over the pool and colourful garden. All four of the bedrooms here are extremely well appointed, with marble floors, top class amenities and superior comforts. Named after flowering tropical plants and trees, all are equipped with air-conditioning and ceiling fans, as well as TVs and DVD players discretely hidden in wall cabinets. 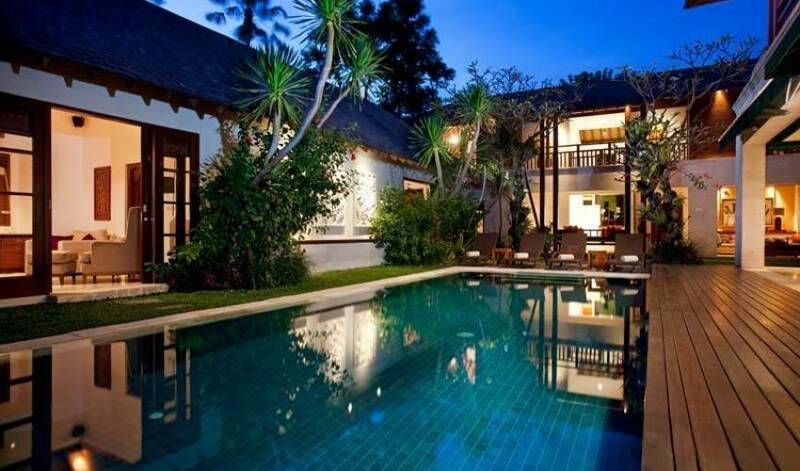 •	Excellent location - close to shops, beach, very safe are. •	Lovely Villa – facilities great and in fairly good condition. Few things that are getting a bit old/run down e.g. Gym equipment did not work. Treadmill was not in the gym and the stepper machine did not work so couldn't really use the facilities. Could only get certain channels on certain TV's in the villas. No consistency…this just a small issue. •	Rooms kept very clean and the staff do an excellent job of being very discreet. I would also like to add that the communication and experience received from you was outstanding. As a customer looking through the thousands of Villas that exist I think the service that you provide is excellent and is a huge part of why the experience was so good.